the managing/support of volunteers is seen as an important and key role within the organisation, leading to the appropriate support and recognition for those carrying out this function. If you are a Voluntary, Community or Social Enterprise organisation in Salford and would like to support this campaign by signing up to the statement or if you would like to discuss this in more detail please contact Claire Roberts at Volunteer Centre Salford. Email claire.roberts@salfordcvs.co.uk or telephone 0161 787 7795. A key function of Volunteer Centres is to match potential volunteers to volunteering opportunities in organisations in different sectors. We offer anyone wishing to volunteer support and advice in matching their motivations and aspirations to appropriate volunteering opportunities. This may include progression towards employment or in developing career options, but there are also many other motivations such as learning, keeping active or simply helping others. Whatever the motivation, volunteering is a positive and informed choice. Internships - A time limited placement that allows a person to gain practical experience by undertaking an activity that allows a person to gain on-the-job experience. If the intern is under contract (written or implied) and unpaid, but working for a charity, voluntary organisation, associated fund-raising body or statutory body, they are likely to be, in the eyes of the law, a ‘voluntary worker’. There is a ‘voluntary worker’ exemption from the National Minimum Wage regulations but this is to enable voluntary organisations to continue working with volunteers (i.e.those who wish to donate their time/experience for no reward) and where their role would have normally been seen as contractual and, therefore, subject to Minimum (National Living) Wage. We believe that internships are an important way for increasing access to the labour market. However, in practice, not everyone has the resources to undertake a full week’s work for no income and therefore unpaid internship opportunities are not open to all. We believe, as a matter of best practice, that interns should be paid at least the accredited Living Wage. Work experience - A planned period of work-based learning or experience with learning outcomes usually undertaken as part of a programme of university, college or school study, as a short placement, work taster, temporary work, or a period of supported employment as part of vocational training. The placement is usually sourced externally with an employer in any sector (private, statutory, voluntary). Although the person may sometimes source their own placement, they will normally be accountable to the original agency for carrying out the placement to certain standards over an agreed period of time. Work experience is typically not paid, not contracted and short-term. This is often where people, especially young people, are offered the opportunity of a taster of a particular job and given the chance to try various tasks or shadow a member of staff. This may be part of an educational course or ‘into work’ programme. We believe that work experience is a valuable means of learning. It is distinct from internship in that it will usually take place in the context of wider study and generally be short term. Mandatory Work Activity – Mandatory work initiatives from the DWP or its sub-contractors are not volunteering: the principle of freedom of choice to participate in them is compromised and many claimants face benefits sanctions if they do not engage in the compulsory placements. 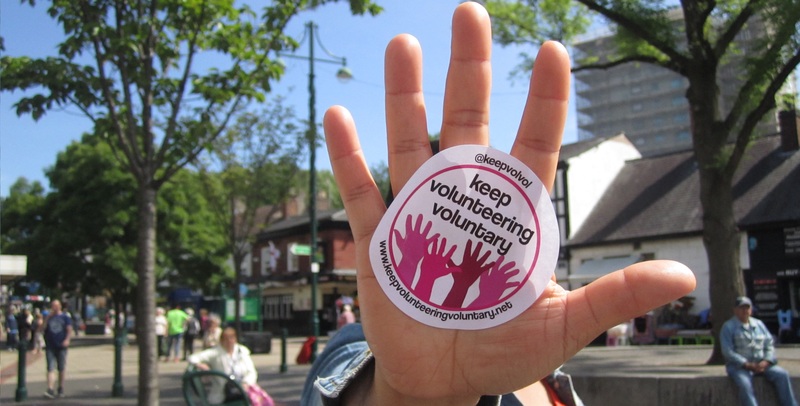 We, the Volunteer Centres across Greater Manchester, will not be engaging with the Mandatory Work Activity process. We believe firmly that volunteering must always be about choice. Volunteer Centres are not normally funded or contracted to provide support in finding unpaid roles for students/trainees to undertake as a component of their course of education or training nor unpaid roles for people as part of statutory or mandated work programmes. We are also mindful of the risks to our own sustainability of increasing requests to identify volunteering opportunities from providers who are contracted to do this as an integral part of a commissioned service (e.g. Work Programme). Following from the above, staff of Volunteer Centres will refuse third-party requests to confirm, or otherwise, attendance at the Volunteer Centre, neither will we sign documentation to this effect. We encourage volunteers to maintain their own record of hours spent volunteering and promote recognition of achievements by volunteer involving organisations. However, we must refuse third party requests to verity or confirm hours worked or activities undertaken, neither will we sign documentation to this effect. these services, particularly in relation to those clients who need additional support. Join us and over 600 other voluntary sector organisations and sign up to the agreement to Keep Volunteering Voluntary.